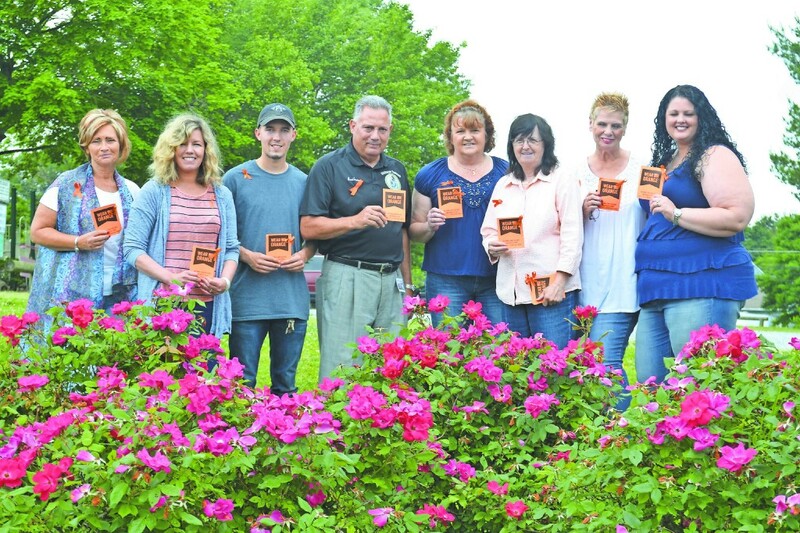 Employees of the township stood united last week before National Gun Violence Day, June 2. Harrison Township residents and people across the country wore orange last weekend to support the organization Wear Orange which began in 2013 by a group of Chicago residents who lost a friend to gun violence. Orange is the color worn by hunters to announce their presence to other hunters; the group says the color represents life. Pictured are Sharon Chew, Cyndi Quast, Harrison Hall, Mark Gravinese, Diane Malloy, Sue Champion, Paula Undercuffler and Kathy Donatis. Opinions can be exaggerated and people are placed in camps when it comes to hot-button issues such as guns. Some words are polarizing and can paint a distorted picture of an issue. Moms Demand Action For Gun Sense in America is a group that says it has a different narrative, one not so strictly set in the realms of for or against. “Moms Demand Action is for gun sense, not gun control. We support the Second Amendment but we feel we can do more about the 96 deaths that take place in America each day,” Lynne Bussott, representing the Gloucester County chapter of Moms Demand Action, said. While the group spans the nation, Bussott, a teacher in the Swedesboro-Woolwich School District who must practice lockdown drills with her 7- and 8-year-old students, said, “We try and promote the good bills that support good gun sense laws,” adding that each chapter is concerned about what happens in its respective state. “What is good for our state may not be good for Utah,” she said. Moms Demand Action — New Jersey, representing all chapters in the state, announced its support for several recent measures made by state government. The state Senate passed laws requiring background checks on all gun sales, a ban on armor piercing ammunition, the limiting of magazine capacity and others. At the local level, Moms Demand Action is making its voice heard as well. Both Harrison and Woolwich townships and the Borough of Swedesboro have issued proclamations declaring support for further gun safety measures. “[The proclamations] mean that gun violence awareness is spreading and it is important to have people in towns — like mayors and committee members — be aware of what is happening across our country … they are the ones in charge of our communities laws and decisions,” Bussott said. In addition to advocating for legislative moves, Bussott said the group engages with community members to “normalize the ask,” when considering children being present in another families’ home. Partnered with a program called Be Smart, Moms Demand Action attempts to reduce the tension when the topic of guns and children is brought up. Stating figures from the Centers for Disease Control and Prevention and The Brady Report, Bussott said approximately every 36 hours, a child is unintentionally shot due to irresponsible gun ownership. Another important aspect about Moms Demand Action, Bussott explained, is fostering awareness of the people who must live as gun violence victims. “The numbers that are reported are the number that were killed. Do you know how many people were injured in Parkland?” she said, adding that people only think of 17, the number of lives lost. For more information about Moms Demand Action, visit https://momsdemandaction.org/.